In 1961 Brazil issued two stamps to commemorate the 100th anniversary of "Olho de Cabra," the "eye of the goat" stamps issued in 1861. Two Brazilian stamps from 1861 are featured on those issued in 1961, the 380 and 430 reis values. These are the "olhos de cabra," because the design is supposed to look like a goat's eye." In addition to the "goat's eyes" each of the stamps also features a map, the low value a map of France and the English Channel, the high value, a map of the Netherlands. Mark Honig has called my attention to a note in the CartoPhilatelist for September-October 1961, p. 46, which indicates that the maps represent the destinations served by the rates commanded by the stamps, France and the Netherlands respectively. The stamp was issued in 1940 to mark the 50th anniversary of the Pan-American Union. In addition to the map profiles of President Franklin D. Roosevelt and President Getúlio Dornelles Vargas of Brazil. Vargas was the dictator of Brazil from 1930 to 1954. The discovery of the Western Hemisphere created a need for cheap labor to exploit the resources discovered there which brought about a great expansion of slavery in the 1500's. While a lot of attention has been paid to the institution of African slavery in the North, the country with the largest and longest experience with slavery was not the United States but Brazil. It was not until 1851 that the importation of slaves was prohibited and not until 1888 that slavery was abolished. Today Brazil has the largest black population outside Africa. 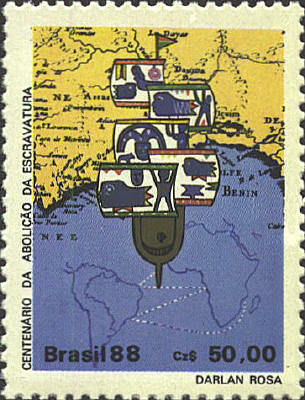 The stamp shows a portion of a map of Africa showing the Gulf of Benin, a view of a slave ship from above, and outline maps of Africa and South America with the slave trade routes between them.